These cookies make me feel super fancy. Not because they're particularly complicated, but because I used an actual gram measure scale when making them. What! I know. Super fancy times. Also? 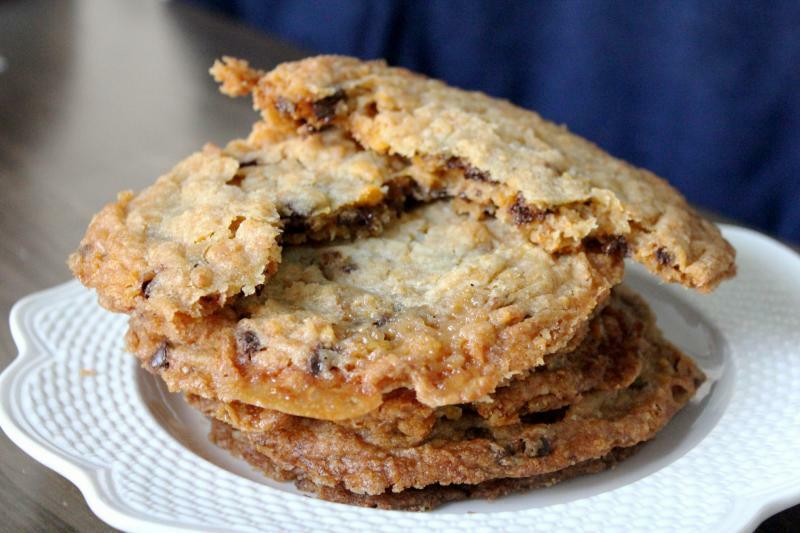 These cookies are a replica of one of the famous Momofuku Milk Bar's cookies. Well, not a replica necessarily, because they actually come from Christina Tosi's cookbook, which also features their Crack Pie, among other things that I will surely be trying in the future. The recipes are pretty funny sometimes because they are all basically references to other recipes in the book. So basically, there are a lot of bases for you to work into multiple recipes. 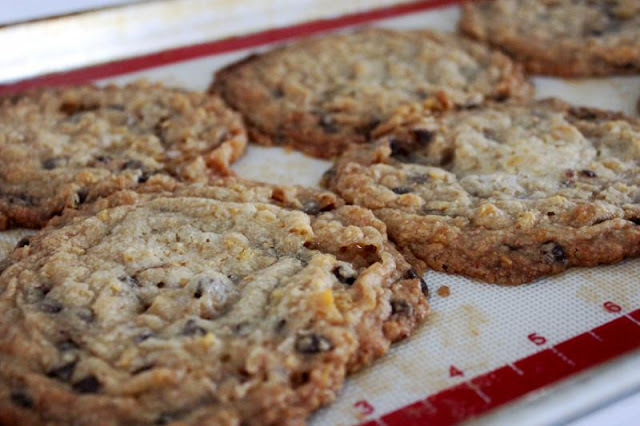 These particular cookies only use one such base - the Cornflake Crunch. And man oh man, you can just munch on the crunch all by itself and you would probably be happy. 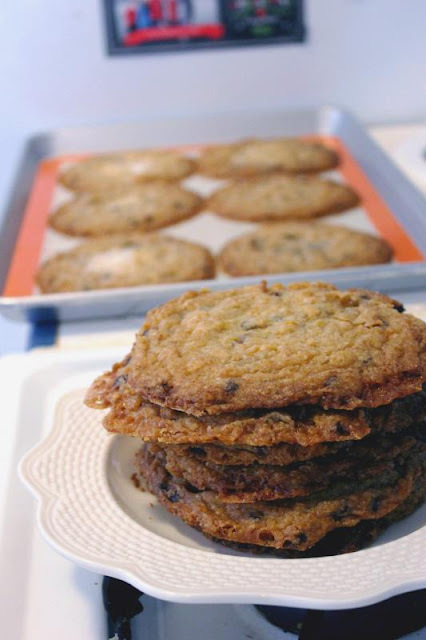 But go for the whole shebang and make the cookies, you won't regret it. One thing I must tell you - these cookies are BIG. Like, the size of my hand huge. Only make six to a pan, and even then make sure they are spaced out or they will run in to each other. I wonder if mine spread a bit more than intended, but it doesn't matter, because they taste pretty great anyway. They're not too sweet, but sweet enough to satisfy that dessert craving. The edges thin out and crackle thanks to the marshmallows, while the middle stays nice and chewy with the interesting texture provided by the cornflake crunch. I'm going to include both the grams and the cup measures below, as I know most people, including myself up until this last weekend, don't have kitchen scales to get fancy with it. Christina Tosi's Cornflake Marshmallow Chocolate Chip Cookies, from the Momofuku Milk Bar Cookbook. 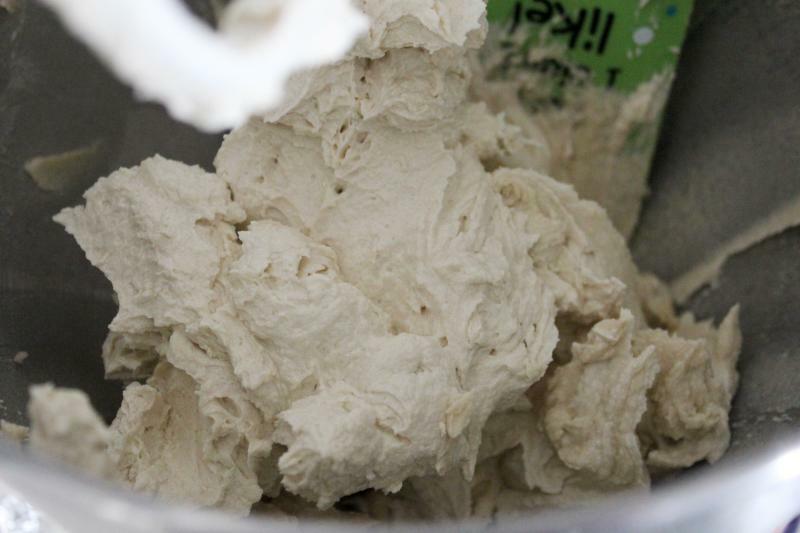 Combine the butter and sugars in your stand mixer with the paddle attachment; cream together on medium-high for 2-3 minutes. Scrape down the sides of the bowl, and add the egg and vanilla; beat for 7-8 minutes. 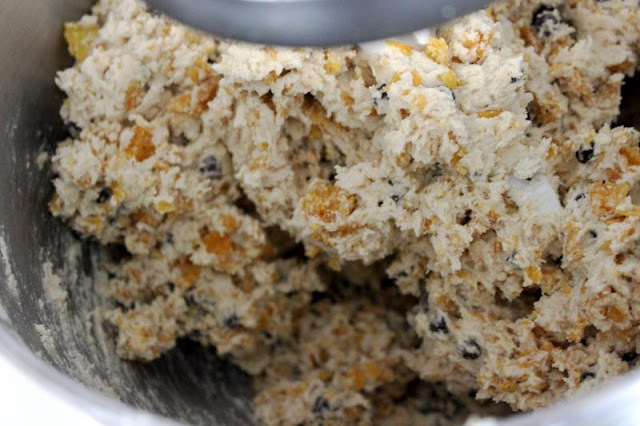 With the mixer on low, add in the flour, baking powder, baking soda, and salt. 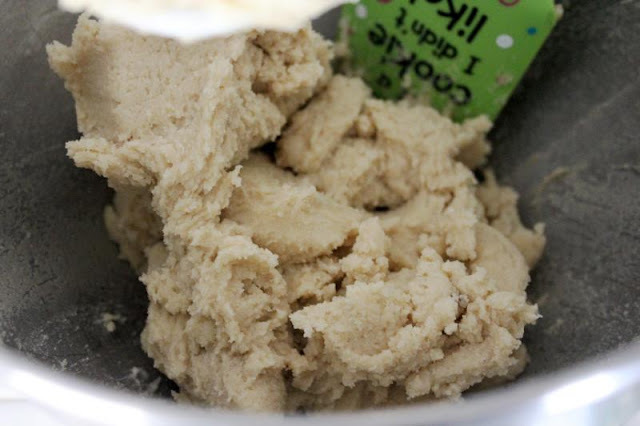 Mix until the dough is incorporated, no longer than 1 minute. Scrape down the sides again. 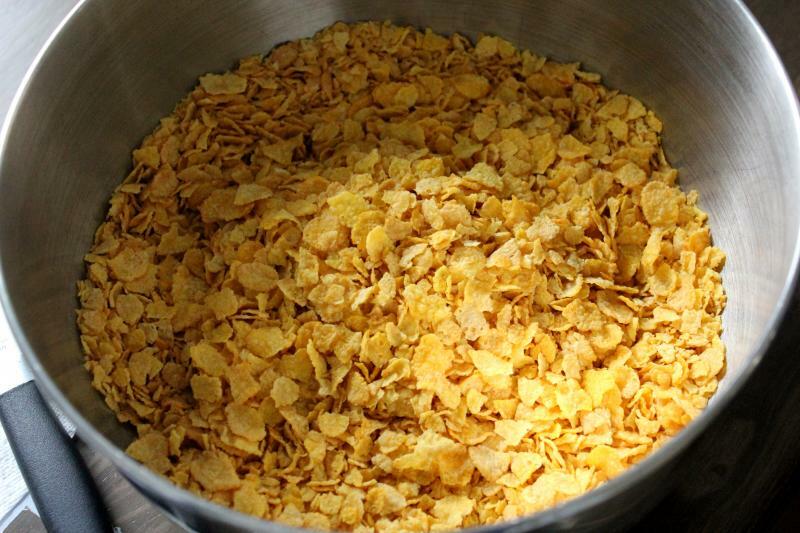 Still on low, beat in the cornflake crunch and mini chips no more than 30-45 seconds until just combined. Then mix in the mini marshmallows until just incorporated. 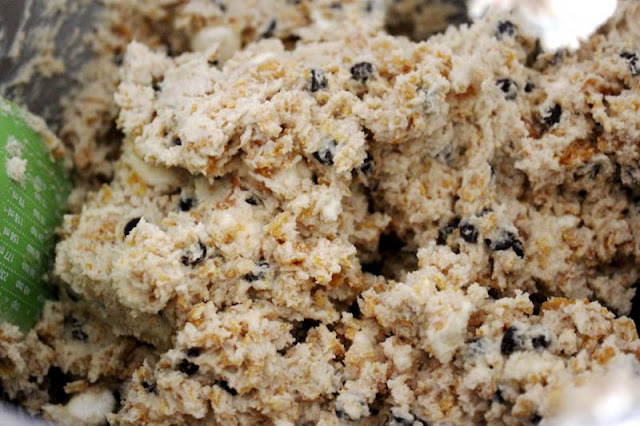 Use a 2 3/4 oz ice cream scoop or 1/3 cup measure and portion out the dough onto a parchment-lined pan. Pat the tops flat, wrap the pan in plastic wrap and refrigerate for at least an hour, or up to a week. Preheat the oven to 375°F once you're ready. 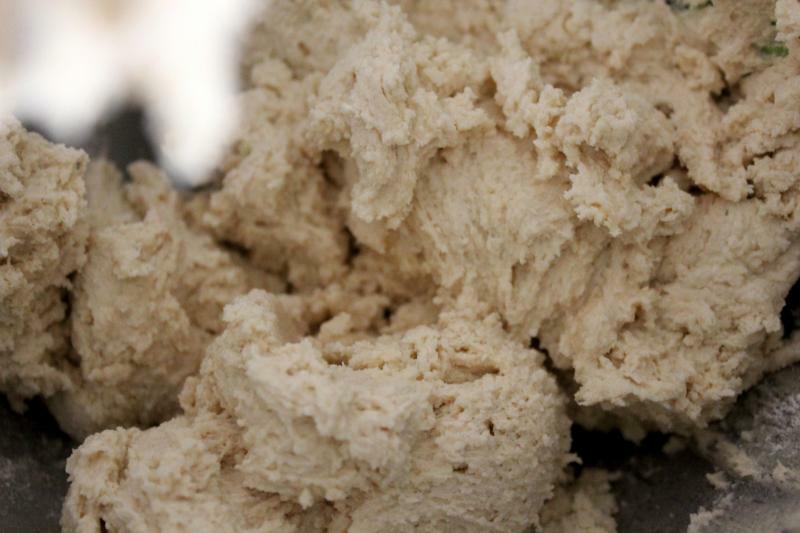 Arrange the chilled dough bits at least 4 inches apart on your parchment or silpat-lined pan. Bake for 18 minutes. At that point, they should be brown on the edges and just starting to brown in the center. If too doughy, leave in 1 more minute. 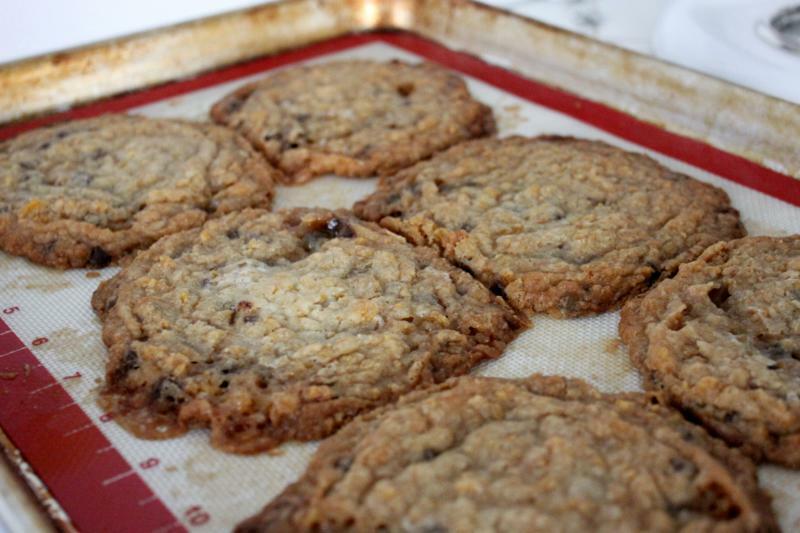 Cool the cookies completely on the pan before transferring to wherever you're going to serve or keep the cookies. They should keep for 5 days. Pour the cornflakes in a medium bowl and crush with your hands until about 1/4 of the size. Add the milk powder, sugar and salt, toss to mix. 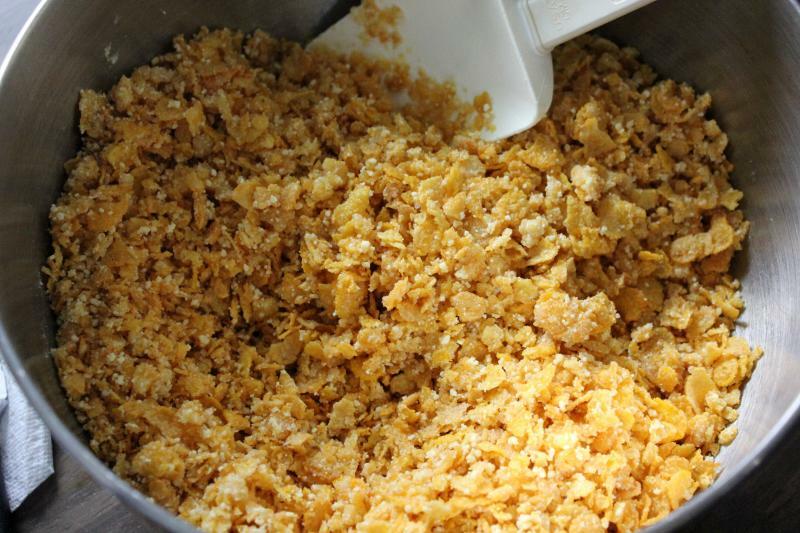 Add the butter and mix to coat, creating small clusters. 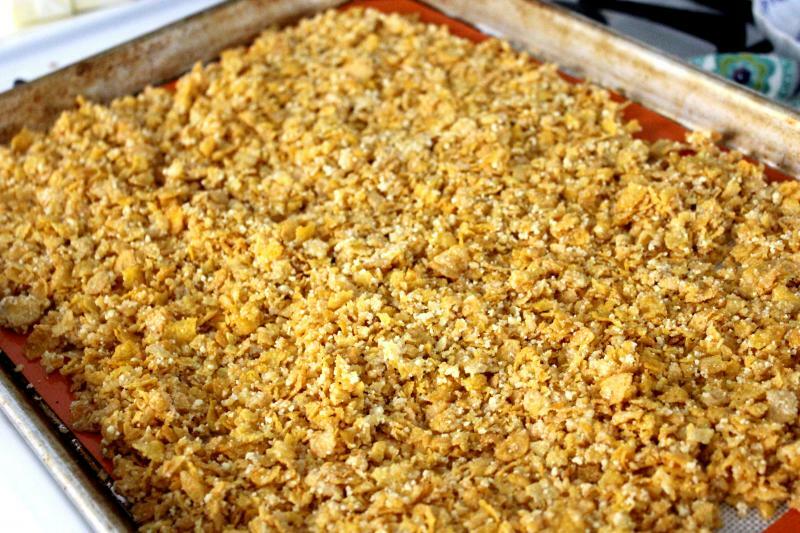 Spread the clusters on a parchment or silpat-lined sheet pan and bake for 20 minutes. Your house will smell buttery and amazing. Cool completely before using in the below. First, get your hands in to those cornflakes and crunch them up to about 1/4 the size. 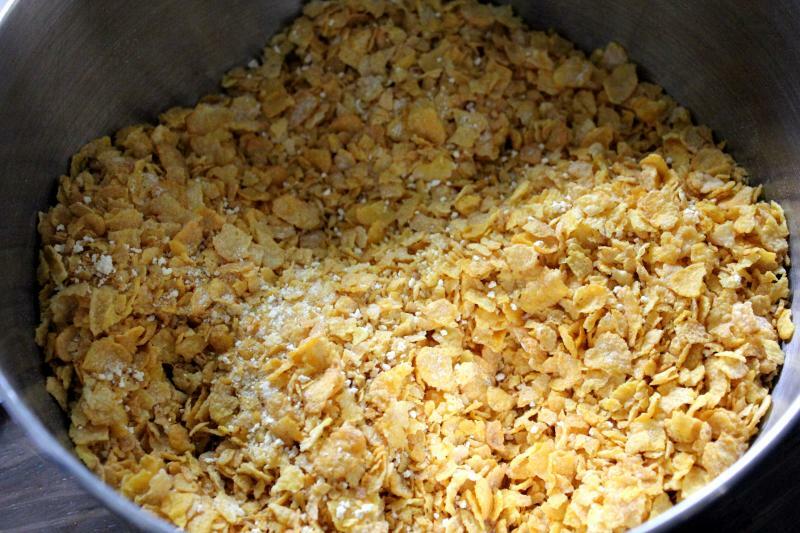 Then toss in your sugar, milk powder and salt. And let's not forget the melted butter. Mix that on in too. Spread that out on a silpat or parchment-lined baking sheet and bake at 275F for 20 minutes. 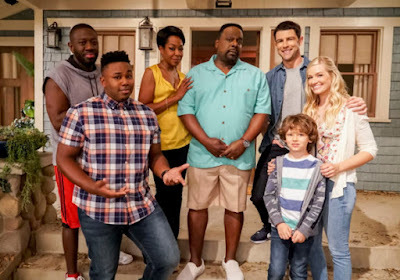 Your house will smell amazing while this is happening. It will be just slightly browned and altogether delicious. Now let that cool completely before you use it in a bit. Now, on to the dough. Beat together your butter and sugars for a few minutes until it's all incorporated. Then add in your egg and vanilla and beat for 7-8 minutes. Yes, you heard that right, 7-8 minutes. The egg will make the dough puffy and fluffy in that amount of time. And then it's time for your dry ingredients - flour, baking powder, baking soda, and salt. Mix until just incorporated. Don't overdo it. 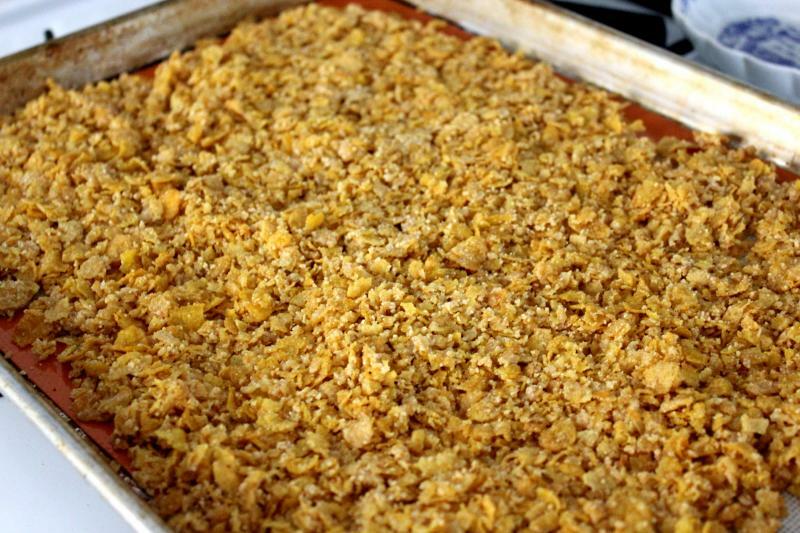 Then it's time to add in your cornflake crunch and chocolate chips. Give it a quick mix. Finally, add in your marshmallows. Another quick mix. 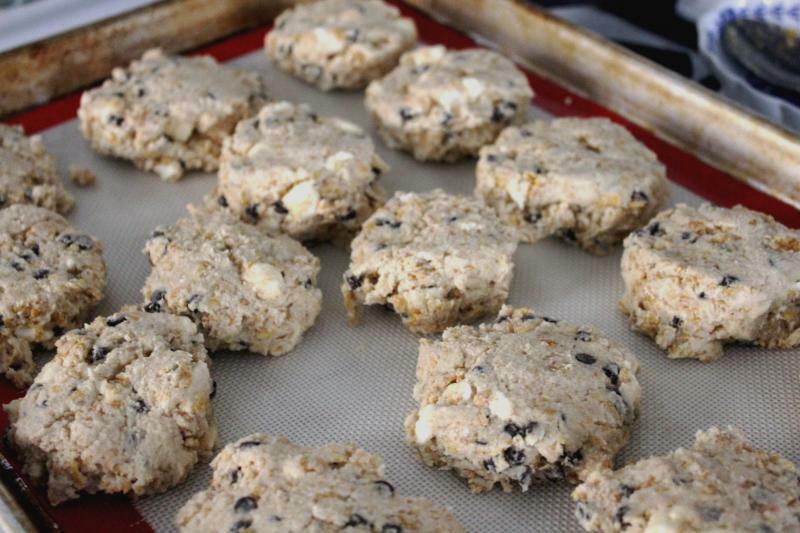 Scoop out about 1/3 cup size cookies and put them on a sheet, cover 'em up, and refrigerate for at least 1 hr or up to 1 week. After the dough is good and cooled, preheat your oven to 375F and space those suckers out 4 inches apart on your silpat or parchment-lined sheet. I did six to a sheet and that seemed to work best. Bake for 18 minutes until the edges brown and the middle is still light. Let them cool completely on the pan. This is when a second pan comes in handy. And voila! 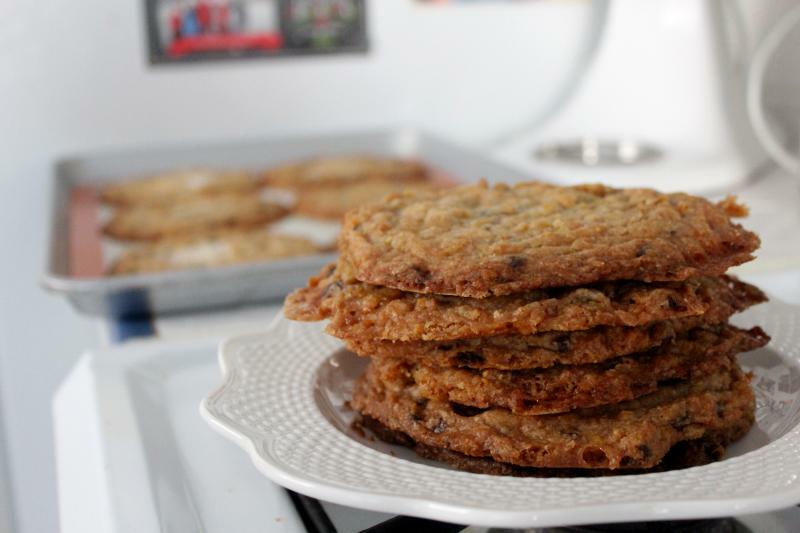 A pile of giant cookies to eat to your heart's content! Your metaphorical heart, not your literal one, because it is probably not quite as happy about the cookie eating. These look delicious! If you haven't already, I would highly recommend trying the Momofuku blueberries and cream cookies. Not sure if the recipe is in the cookbook, but you can find it all over online. I normally don't get excited about dessert without chocolate, but these cookies are absolutely incredible.